The date for the Spring 2019 Sacrament of Confirmation has not yet been set. Typically it is in May! We will not know the date for Confirmation 2019 until at least December 2018. We understand that many of you need to plan far in advance, but we rely on the bishop&apos;s schedule from year-to-year. When does Confirmation preparation begin at St. Albert&apos;s? Confirmation preparation will begin in students&apos; 8th grade year, and students will be confirmed in the Spring of their 9th grade year. Current 9th graders will be confirmed in Spring 2019. Current 9th graders are asked to commit to at least two ongoing service commitments, ideally one out in the community and one through church. We want service to become a regular, ongoing part of your life! We ask students to write down the two service sites they are committing to and to monitor the dates of their involvement. They can access this "Service Recap and Reflection" form at the Gr. 9 Confirmation Information page. CURRENT 8th graders are asked to participate in at least ONE parish-related service opportunity during each year of Confirmation prep. Potential service opportunities include: Sunshine Supper; Mobile Food Pantry; Luke House; serving as a liturgical minister (altar server, hospitality, or reader); participating in Youth Ministry service opportunities; Mission Trips; Love Begins Here (LBH); Albertfest; etc Students will record these events and write a brief reflection on their experiences in their Confirmation Readiness Report, accessible here. What are some of the other requirements? Every student is required to participate in a Confirmation interview in the final months prior to receiving the sacrament. A lot can happen in two years time, and this interview is one final conversation to assess the student&apos;s preparedness and willingness to enter into the sacrament. Each student needs to select a Confirmation sponsor to walk with him/her on the Confirmation journey. Your sponsor needs to be a confirmed Catholic who is actively practicing the Catholic faith. You may select a sibling to be your sponsor, but you cannot choose your own parent as your Confirmation sponsor. Basically, your Confirmation sponsor should be someone who you look to as a role model and a mentor in your faith life, someone you can talk to about your faith questions and who can help you to grow in faith. What is my responsibility as a sponsor? Read all about your role (and find Candidate/Sponsor Sessions) by clicking here! What if the person I want to choose as a sponsor lives out of town or out of state? As long as you can commit to regular and ongoing conversation with this individual during the Confirmation process (through phone calls, Skype, FaceTime, etc. ), you may choose them as your Confirmation sponsor. What if I want to do home study? Please visit our Religious Education Home Study page for more information about Home Study requirements. Where do I find the Confirmation documents I need to turn in? Information pages (links to the right). Want to understand more about what Confirmation IS, and why we do it? 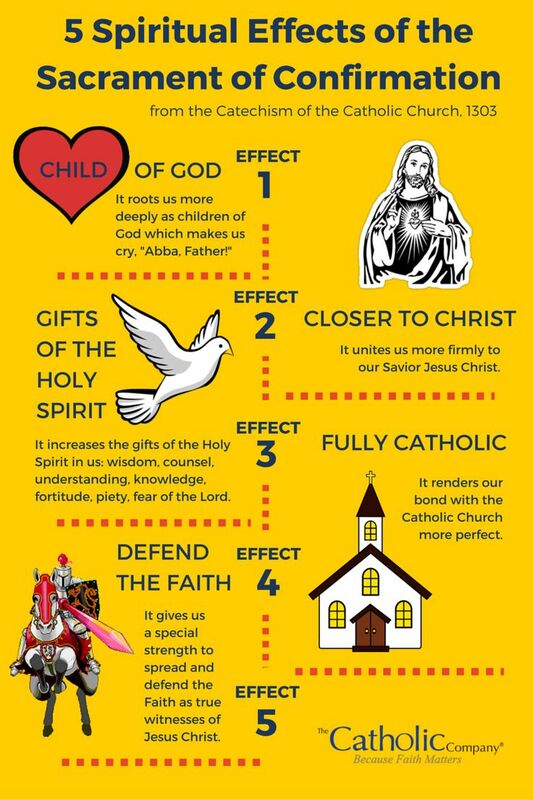 Check out this awesome infographic from The Catholic Company!